Indiana State University geology students' collaboration with an alumnus will be presented at the Geological Society of America in October and the Indiana Academy of Science in March. Identical twins Kyle and Caleb McDaniel worked alongside Derrick Unger, a 2005 graduate, in the Cumberland Mines in Tennessee this summer. For two days, Kyle and Caleb took samplings of sphalerite and calcite to determine the spatial distribution of germanium and gallium, which are important superconductors. The pair says they wanted to see if there was enough germanium and gallium present in the waste material to be mined for a profit. "The practical skills that Kyle and Caleb brought to the team were a strong asset, and it was great seeing fellow ISU students apply their knowledge and skills to solve real-world problems," Unger said. This academic partnership between Kyle, Caleb and Unger was made possible by State geology Professor Sandra Brake. Unger worked with Brake on research for multiple summers during his time at Indiana State. "Dr. Brake has been an excellent advisor, professor and mentor to us both. She has opened a lot of doors for us since being at Indiana State," Caleb said. Kyle and Caleb have presented at the geology conference once before and at the time, shared the results of their research into acid mine drainage in West Terre Haute. The first study, presented by Kyle, dealt with metal that pollutes the sediment surrounding the channel. The second study, presented by Caleb, involved blackberry plants' uptake and the storage of metals within their cells. They concluded there was a higher level of certain toxic elements within the samples. The sons of State alumni Annette and Robert McDaniel, Kyle and Caleb will graduate in May and hope to attend graduate school this coming fall. They have been involved in numerous campus activities including Sigma Alpha Epsilon, Sigma Alpha Pi, the Environmental Science Club and many philanthropy events. Looking further into the future, the pair says they would prefer to attend the same graduate school and later live in the same city but not necessarily work for the same employer. Photo: http://photos.indstate.edu/Other/Media-Services/Submitted-Photos/Staff-Uploads/i-g79GbNX/0/X3/DSCN4060-X3.jpg -- Indiana State University seniors Kyle and Caleb McDaniel look at rock core samples with Derrick Unger, center, a 2005 graduate of Indiana State. 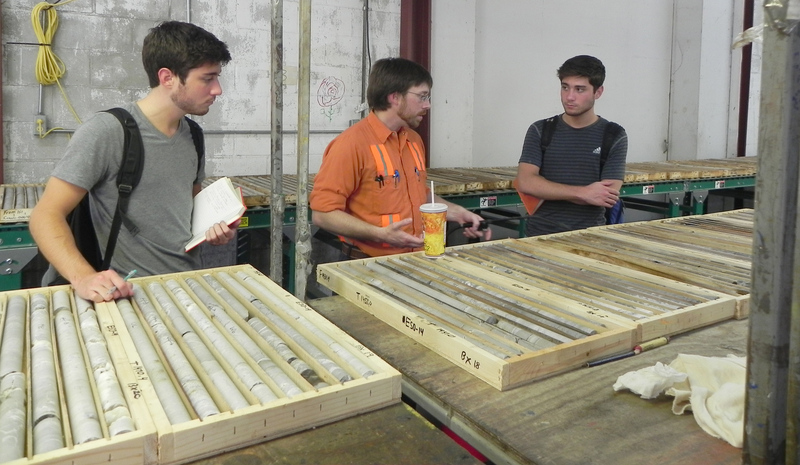 Identical twins Kyle and Caleb McDaniel worked alongside Derrick Unger, a 2005 graduate, in the Cumberland Mines in Tennessee this summer and will present their research at the Geological Society of America and the Indiana Academy of Science.